Did you know there are 5 million empty jobs in the U.S. waiting to be filled? And even though 47% of the workforce are women, if businesses don’t enable them to enter that workforce, then re-enter it after pausing to raise children, who is going to fill those empty jobs—657,000 of which are in IT? 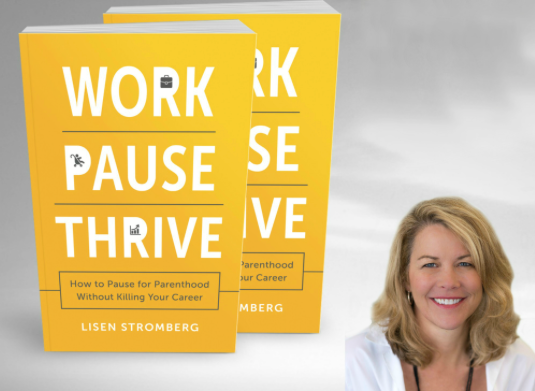 Perhaps Lisen Stromberg’s new book, “Work Pause Thrive,” has some answers. As I describe in a recent article I wrote for The Huffington Post (which you can read here), having a career and having a family might be a little easier than it was, say, 30 years ago, but not all that much. At least, this was Stromberg's experience. She found it quite hard to pursue a career in advertising and marketing while raising children so she paused, pivoted and became an award-winning journalist. Along the way, she realized that other women were struggling with the same choices, which caused her to ask, is pursuing a career and having children an either/or for women? And if so, does it have to be this way or could things change? Like a true entrepreneur, Stromberg got to work seeking ways to solve the conundrum. First, she conducted research, surveying 1476 women (and a handful of men) and personally interviewing 186 women, trying to discover how well (or not well) women are managing to balance their working lives and mommy lives. What she found was that irrefutably, the U.S. has become a nation of women breadwinners (almost half of all American workers are women) and with numbers come power—in this case, the power to change. Stromberg believes that for the workforce to be transformed into one where women and men can perform across all their roles—home, work and family—the workplace culture needs to change, focusing less on work/family needs as a problem to solve and more on creating a better work environment for both genders. Stromberg's solution was to launch PrismWork, a culture innovation consulting practice that works with organizations to attract, retain and promote women and other under-represented talent. And guess what happens when women workers are valued, empowered, allowed to pause for personal commitments, and then warmly embraced when they return to their careers? Do companies fall apart, unable to handle this start-stop-start-again pattern? No, in actuality they thrive, benefitting from the intellects and energy and innovative thinking of these amazing women. We can only hope that more and more businesses figure it out. Perhaps Stromberg's “Work Pause Thrive” will help. In order to build a successful business, a highly-functioning company culture is not just important, it's absolutely critical. Here are three of our recent blogs that explain why. If you're an entrepreneur and want to improve your business's culture (or find out what it is), give us a call for a free 1-hour consult.